This chapter illustrates quickly how to get an environment for Free Pascal/SDL2 development running under Linux. Attention: The following instruction may work for many Debian and Ubuntu based Linux distributions, others probably need different installation procedures. In contrast to the Windows, in Linux there are so many variables according to the operation system (thousands of different distributions) that there can’t be a more or less generalized way how to install it. Anyway I’d like to demonstrate how it worked for me and give some hints which may help you to install it to your favorite distribution of Linux. The first step is to install the Free Pascal compiler (version 3.0.0 or higher), the Compiler’s source code (same version as the compiler) and the Lazarurs IDE (version 1.6 or higher). First check if your package manager provides this software in these (or higher) versions! It is likely that you find the software but the versions may lack behind. If that is the case, download and execute these three .deb files in the shown sequence. Again Careful: These files are right for many Debian and Ubuntu based distributions (like Linux Mint) but may be wrong for others. Try to find out the right ones for your Linux. 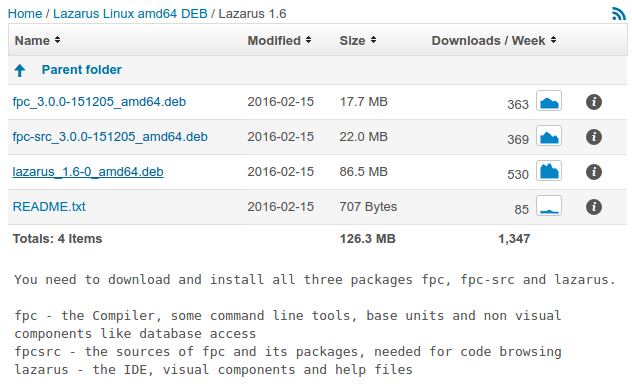 SourceForge download page for all three files necessary (accessed via Download button at lazarus-ide.org). The original description is kept in the image. If everything went right, Lazarus can be started up by typing “startlazarus” in the terminal or by finding the program here: /usr/bin/startlazarus which is a symbolic link to the actual executable here: /usr/share/lazarus/1.6/startlazarus. On your system it may be located at a different location but these are rather standard location. Before proceeding, my suggestion is to start a new project (simple program) and try out if you are able to do a simple compilation of a very simple program. E.g. a simple writeln-statement. 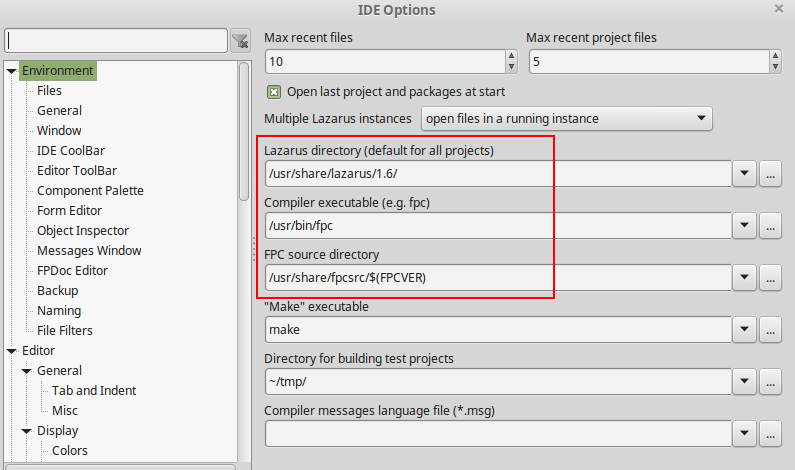 As a tip you should open up Lazarus’ Console to see the output of your program and writeln commands. You can find the Console at Window > Console. Get the latest version of the translated SDL2 units. Make sure you have the master branch chosen and then click on “Clone or download”, then “Download ZIP”. This folder is suggested as a place for the SDL2 units. 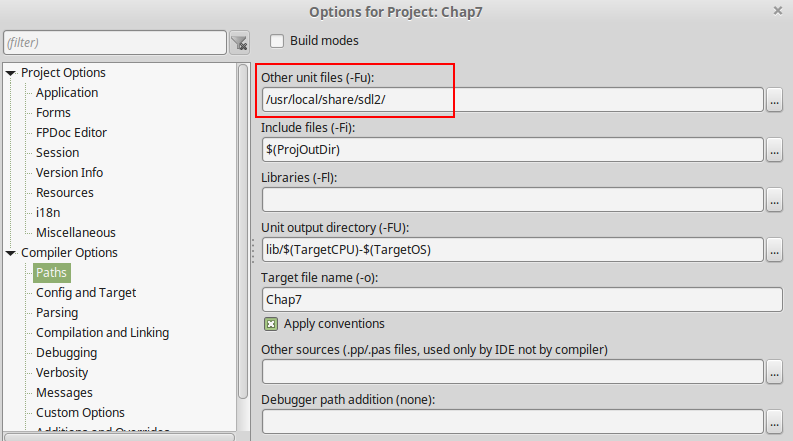 By the way, “Chap7” is just a random name for this project and you may have anything else there instead (I was trying out Chapter 7 tutorial code). To copy the folder to /usr/local/share/ you usually need root permission. Also make sure the new folder allows for access to its files. In my case I had to make sure that the “root group” has access to files. Since SDL2 is very widespread it is very likely that you distribution maintainer already included the files. Installation of the SDL2 dynamic link libraries in Linux via the package manager. As you can see, for me at this moment the SDL2 dynamic link library, version 2.0.0 (libsdl2-2.0.0) was already installed (the small green check mark indicates this in Linux Mint). Anyway, SDL2_gfx (libsdl2-gfx-1.0.0) and SDL2_image (libsdl2-image-2.0.0) weren’t installed. 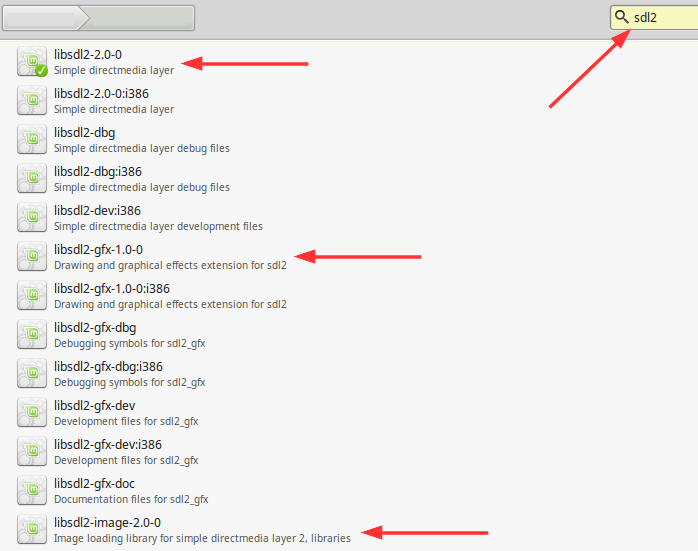 At least for my tutorials SDL2_gfx is not necessary but you may try it out. The version of these libraries does not necessarily need to be the most recent unfortunately. If you really need the most recent versions here, you may try to contact the maintainer to ask to update the version. Repeat the same for all libraries (SDL2_image, … and so on) you want to use. Congratulation! After that, everything should run smoothly :-)! I tried chapter 3-9 and all worked well for me. On opening up a Lazarus project (.lpi file) and try to re-run it, I get an error window titled “Launching application invalid” which said “The launching application “”[full path including the execution file of the project]”” does not exist or is not executable.” and further “See Run -> Run parameters -> Local“. Not sure why this is. Anyway, deleting the executable from the project folder or compiling the project before running it, fixes this issue.